The Fitness Villages really stood out at this year's Dubai Fitness Challenge – inclusive, easily accessible and filled with hundreds of free and fun activities, classes, workshops and more, they attracted people of all nationalities, ages and fitness abilities and became symbols of Dubai’s mission to become the most active city in the world. Everyone loves a day at the beach, but it gets even better when you throw in free water sports, kayaking and the massive National Obstacle Course, which proved particularly popular with visitors. 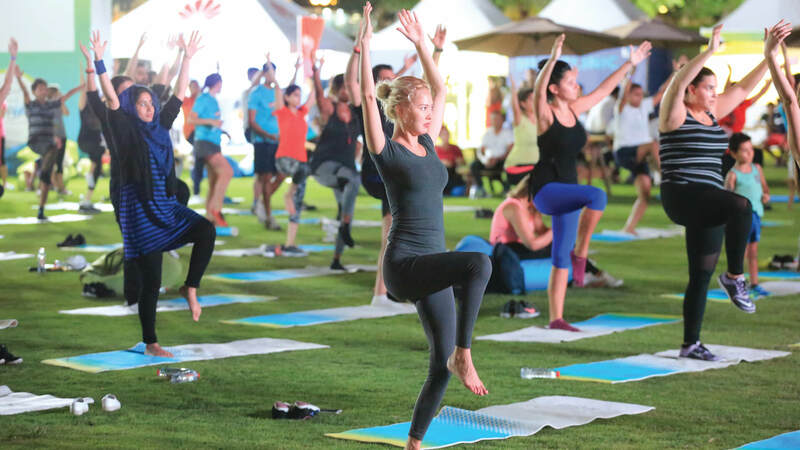 The seaside fitness at Kite Beach Fitness Village was one of the highlights of the Dubai Fitness Challenge, and the venue was packed to the brim with awesome beach-themed activities. People slid into their sandals and embraced the sun and sand, while trying out activities like sunset yoga, beach volleyball and the thrilling XDubai slingshot. Located just outside of the city, the Al Khawaneej Walk Fitness Village was the perfect getaway for families looking to escape the hustle and bustle of the urban jungle. There were plenty of activities for kids and adults alike, like a 5km running and cycling track, a fitness hub, a parkour course, and even an inflatable boxing ring. The kids loved the 30x30 with Disney, a specially created fitness video where they could dance, skip and jump with moves inspired by favourite Disney, Pixar and Marvel characters. And of course, the cycling activities took centre stage at this fitness village. Free bike rentals let everyone cycle away to their hearts’ content, while group cycling events and light-up night rides made every trip a ride to remember. The bright side of running. If taking a run on a man-made island isn’t awesome enough, how about a run through a glow-in-the-dark electric forest? 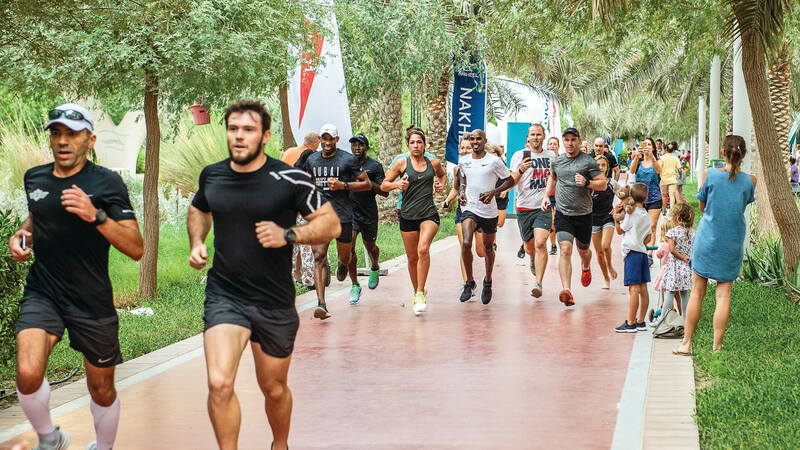 The Palm Jumeirah Fitness Village was a surreal treat for runners and residents alike with a host of fun activities along the way. Visitors enjoyed everything from adrenaline-pumping activities like the DFC Run Club and HIIT sessions to free physiotherapy sessions. And the unique Glow Run that came to life after dark was truly a sight to behold. Another highly visited attraction, the DMCC Park Fitness Village was absolutely packed with thrilling and exciting activities that attracted everyone from adrenaline junkies to moms with toddlers. 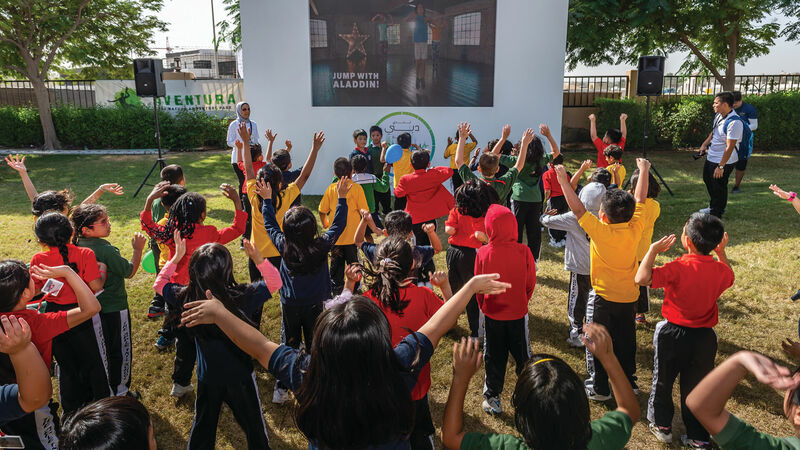 Located in JLT, the village had a fully equipped sports zone, sports coaching academies, a Ninja Warrior assault course, a parkour course, a climbing wall and a bouldering zone as well as a whole lot more. It also offered hundreds of free classes, such as yoga and even martial arts classes. Never a dull moment! 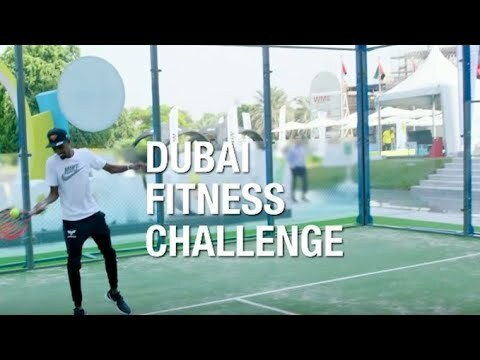 The DIFC Fitness Village had some of the Dubai Fitness Challenge’s most unique attractions, that showed us what happens when cutting-edge tech met physical fitness. Virtual golf and VR sports zones dotted the village, while the cool Technogym zones let you get a glimpse on what the future had in store. It wasn’t all gadgets and gizmos though. Hundreds of free activities, workshops and classes offered the perfect midday workout to people working in the area. The Fitness Village even offered free health and fitness tests to everyone who attended. 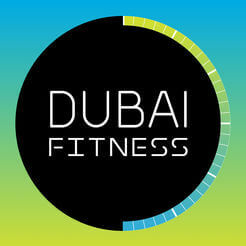 The Dubai Fitness Challenge is over, but your fitness journey continues with the Dubai Fitness App. Set new goals for yourself, keep track of your daily workouts and sync up with other popular fitness apps.